I woke up, my straw bed suddenly felt itchy against my thin, summer coat. I put my head in between my front legs and brushed (yet more) straw off my belly. My parents, my mother, Mystical and my father, Sky woke up too. they were in the two stalls next to me. I put my nose out and let out a shrill whinny, to tell the humans it was time to get up. I saw the paddock horses wake too, but every morning, I woke up first. About ten minutes later, sure enough the humans walked down still yawning. The head groom -and daughter of the owner of the stables- smiled when she saw me and ran over. She was sixteen and yet, I still shadowed her, a good 16'2 hands high pure white Lipizzaner mare. she reached up and stroked my velvety nose, I nickered softly to her and leaned in enjoying every second. "Come ON Alex, we have to take care of the stable horses before our own" a stubborn, bossy voice said. Jane -that's the owner of the stables and her mother- let her lead a ride once, she seemed to think she should be the one to boss Alex around, instead of vice versa like it should be. "Don't let it get to you" she nickered and we both put out heads back inside to eat the hay and drink the water that some of the grooms must have given us. I wistfully watched Alex cleaning a paddock about one hundred meters away from the stable block. I went back inside and rested. A hour later Alex was back and I happily neighed to her. "Hey pretty girl" she itched me under my forelock, getting just the right bit and I whinnied back happily. She led me out my stall and picked out my hooves, giving me a quick brush before tacking me up and putting her helmet on. She mounted me and nudged me towards the wild. I neighed happily back and set into a brisk trot, the stallions watching me admiringly. About a hour later we got to a small lake. "Oh, Rose I love this ride, I don't want it to end yet, lets not go home yet" she said smiling "you choose where we go next"
So I pricked my ears to a trail, I had not noticed before, with a unfamiliar scent, but I was a curious horse so I started cantering towards it. 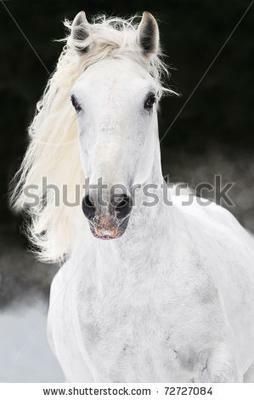 I saw a stallion, a flaxen chestnut stallion about my height, maybe 16'3 rearing. I felt Alex gasped. "Its the Phantom" she murmured and gazed at him. Alex stared her hands shaking with both excitement and fear. I stood tall so that he wouldn't realize I was 0'1 shorter then him. I swished my tail and Alex slowly nudged me forwards, The Phantom backed up and Alex put out a hand for him to sniff, but instead he reared up thrashing his front hooves. I reared up to protect Alex and she fell off unprepared. The Phantom stopped rearing but I didn't. "You almost hurt Alex" I neighed angrily. "He's just a bag of bones! Look at those scars, judges won't like those. He'll never be a show horse!" 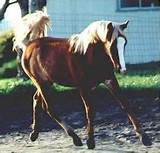 but Alex just hid him in the old barn till she had restored his health and had finished training him, he was a excellent barrel racer!- I walked towards the Phantom and stared at the scars. He immediately backed up, but then walked forwards again. I groomed his scars feeling sorry for him. Alex got up and petted me, The Phantom tossed his head and snorted. Alex mounted up on me and the Phantom pulled away. "Goodbye Phantom horse" I nickered. "Goodbye Phantom then" I nickered turned round and Alex nudged me into a canter. Ace, a pure black friesian stallion who forever tried to flirt with me pushed his head out of the stall door. He was owned by Jessica. He sniffed me. "Wild stallions!" he kicked his hoof at his stall door "you stay well away from them Rose you hear?" "Oh Ace" I whinnied "stop being such a jealous carrot." "I am nothing of the sort I am a purebred show horse...." he began but I didn't bother to listen to the rest. Alex dismounted me and took my tack off. She took me to the washing stalls and washed the sweat out of my coat after giving me a good shampoo. She turned the fans on (its a very high tech stables) and I was soon dry. She combed my mane and tail and brushed me till I was practically sparkling. She smiled. "Good girl, your so pretty" she hugged me and I put my head around her. "ALEX! TIME TO EXERCISE SOME HORSES!" Jessica yelled from the stable block and a few of the horses that had been asleep jumped at the sudden noise and made a thud. "Good girl" she quickly led me into my stall. Ace winked at me so I took the string in my head and shut the top stall door. It was a warm evening and Ace kept yapping on and on about all the medal's he has won. "Did you win any racing competitions? Or cross country?" I asked, knowing this would shut him up. Ace put his ears back. "Now why would I want to get mucky doing that?" He asked flicking his mane around. "But did you ever try it?" I asked calmly. "Well... There is nothing I wont try, but I came fifth" He put his head down as if he had failed everyone. "How many horses competed?" I cooed - I wanted him to shut up, not feel bad. "Five," he sniffed and then snorted. "I would have won if a bit of dirt hadn't flew into my perfect mane, I meant come on I wasn't just going to keep going, I just had a groom!" he complained and I wondered why she had even started the conversation in the first place. I yawned and looked at the darkening sky. "Isn't it time for your beauty sleep?" I teased him softly and at last he sighed and settled down in his stall. 'I wonder what the Phantom is doing right now...' I thought.